We were off to a good and spangly start. 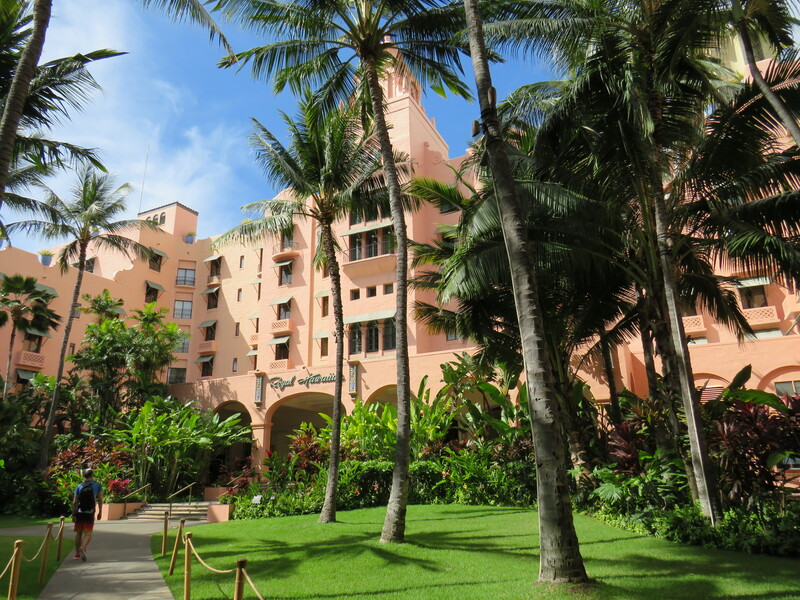 Honolulu is a popular destination for American and Japanese holidaymakers, and features a plethora of expensive hotels, luxury stores and high-rise condo developments. 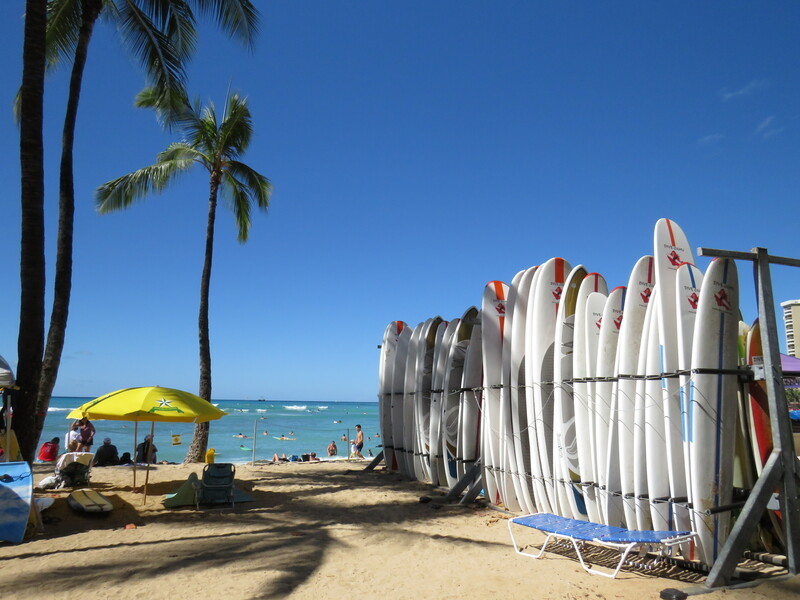 The city has a gentle urban buzz, but it’s all happening at Waikiki Beach. The iconic beach is popular with seasoned surfers, sun kissed beach babes and hardy volleyballers strutting their stuff. 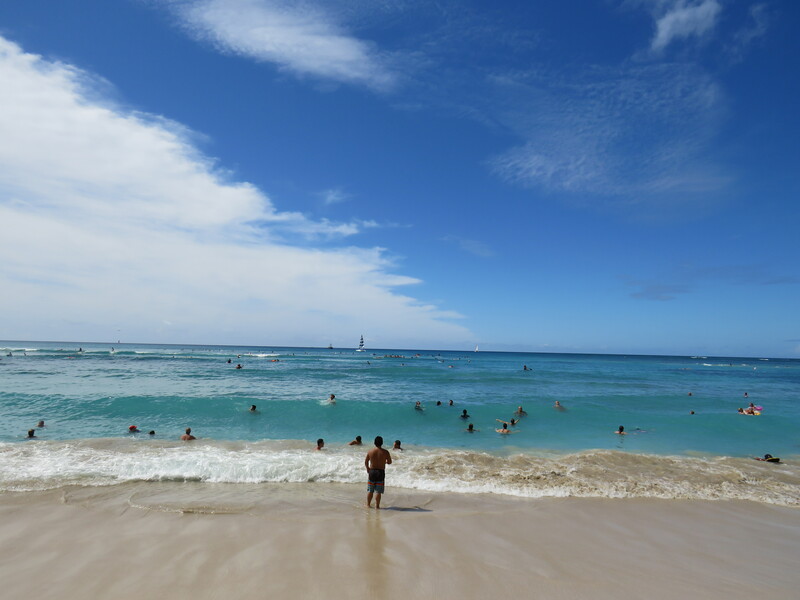 It was a real thrill to experience and the perfect introduction to Hawaiian beach culture. Waikiki Beach: It’s worth spending entire days here to absorb the colourful atmosphere and take in the unforgettable sunsets. The strip is bustling with vacationers. There are banyan and plumeria trees, and there’s a lei-draped statue of Duke Wahanamoku, the five time Olympic medal swimmer who popularised the sport of surfing. 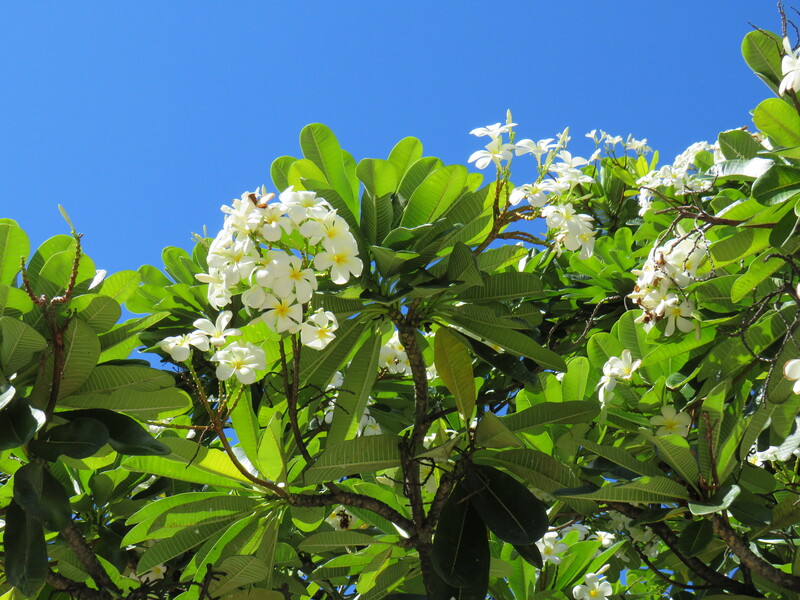 Plumeria Tree with distinctive flowers often worn above the ear. Honolulu, and Hawaii overall, is quite expensive compared to Europe. We were astounded at the cost of fairly basic items: produce like fruit and vegetables that we pick up quite cheaply in Ireland retailed at three times the price we were used to. ($5 celery! Yikes!) Additionally, many food products in Hawaii are imported, heightening the cost to the consumer. It was cheaper for us to eat poke bowls, acai bowls, sushi, and other takeout meals than to prepare even simple meals in our Airbnb’s kitchenette. That being said, Hawaii is really fun for food. You can pick up interesting fruits like dragonfruit, ice-cream and apple bananas, and authentic Hawaiian pineapples fresh from the Dole Plantation. 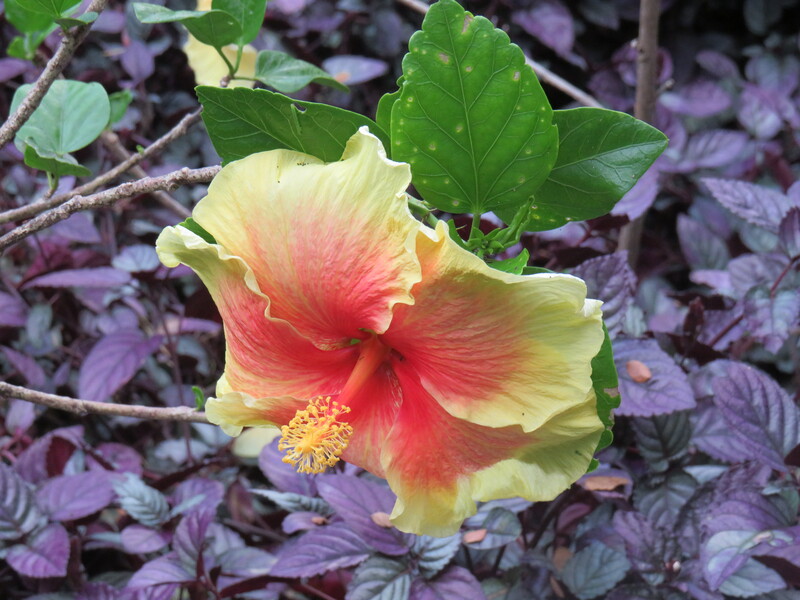 (Tip: You can actually visit the Dole Plantation. We didn’t get around to seeing it, but I’m sure it would be cool to visit and learn about Hawaii’s pineapple industry.) Spam is eternally popular, and spam topped sushi is prevalent in the chilled aisle. The Mexican food is awesome, and you’ll have macadamia nut everything. Macadamia nut crumble is even used to coat fish (and you must try the fish). Oh, and the sweet potato is purple. Purple. I’d never seen that before. Everything’s a novelty! 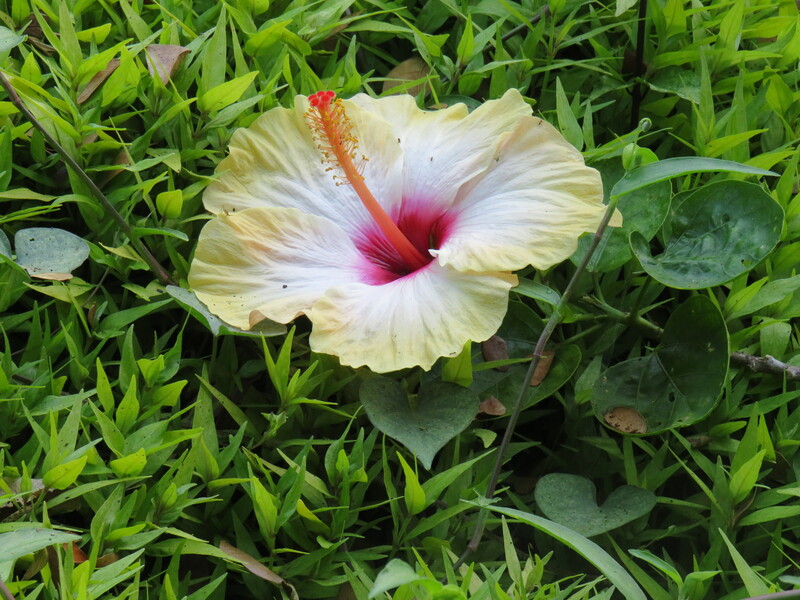 From Honolulu, we took an internal flight to Kauai, or the Garden Island. Kauai is a spectacular place, bursting with lush greenery and astounding scenery that doesn’t quite seem real. The grass really is greener here. 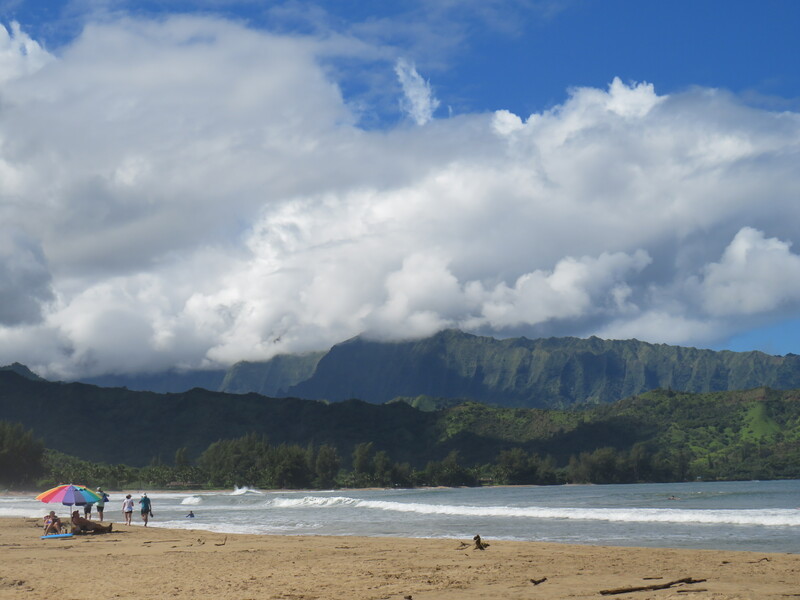 I can’t tell you how many times I was floored by the beauty of the island, and Hanalei Bay was no exception. Hanalei Bay: The musical South Pacific was filmed here in 1952. Curiously, Kauai has more wild roosters than actual inhabitants. They are literally everywhere: under your feet, hanging out at car parks, even running along the beach. During our time on Kauai, we attended a traditional Hawaiian luau. A luau is a party with a feast and entertainment, usually dancing, and the centrepiece of the affair is a roasted pig. We got a kick out of trying typical Hawaiian cuisine like poi, lomi-lomi salmon, pulled pork, macaroni salad, and pineapple bread before settling back to enjoy performances of Hawaiian, Japanese and Tahitian dance. 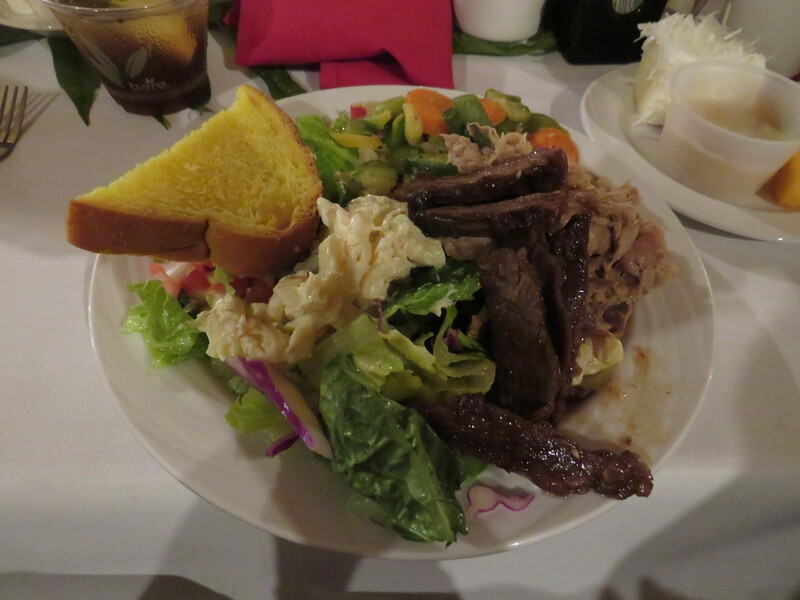 Luau Party Buffet … szlurp! Low point in Kauai: There are regular heavy showers of rain on the island, resulting in puddles and stagnant water, resulting in … mosquitoes. I was savaged. Following on from an incident in Peru during which my face swelled up like the moon, I was only too aware of my susceptibility to massive reactions to bites. I had dutifully researched insect deterrents before leaving Ireland, packing citronella oil, antihistamines, DEET spray, and even a sleeping net, but alas, ’twas all in vain. After several bites swelled to epic proportions I ended up having to take steroids. I fell for Maui right away. 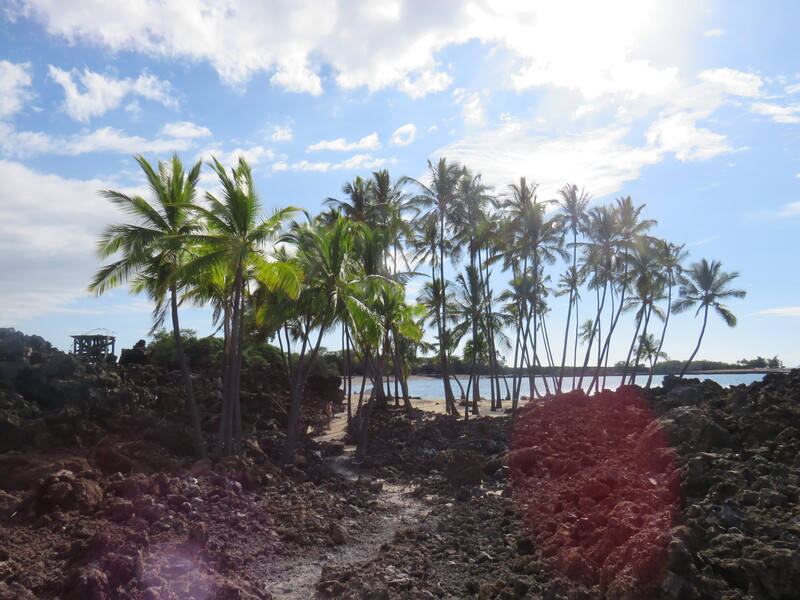 As we made our way from the airport toward Lahaina, several – several! – rainbows appeared over the green mountains. 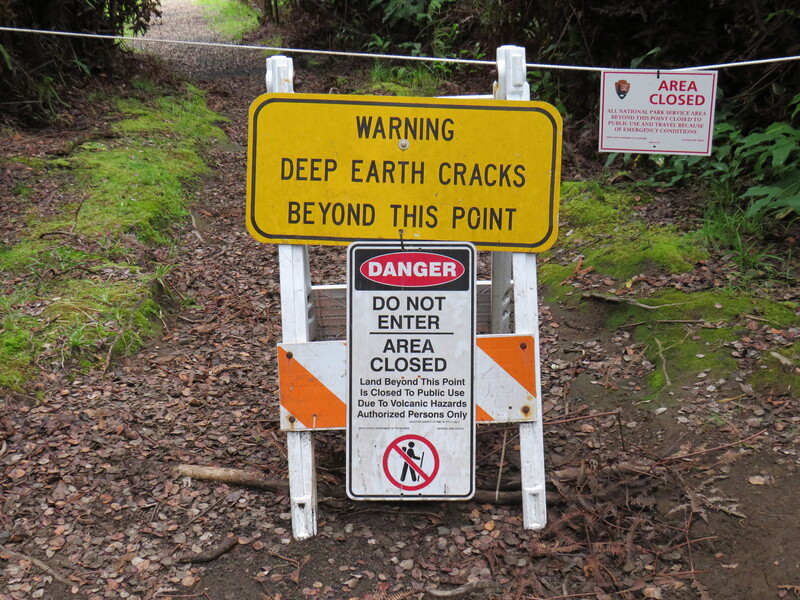 Not only that, but the road followed a winding coastline featuring countless beach parks. You just pull off the highway, park up in a jiffy and step right onto the beach where people are surfing, paddle boarding and snorkelling, or simply gathering with friends and family for picnics and get-togethers. In a charming snapshot of island life, we saw a birthday party underway with children queuing up to swing at a piñata suspended from a palm tree. 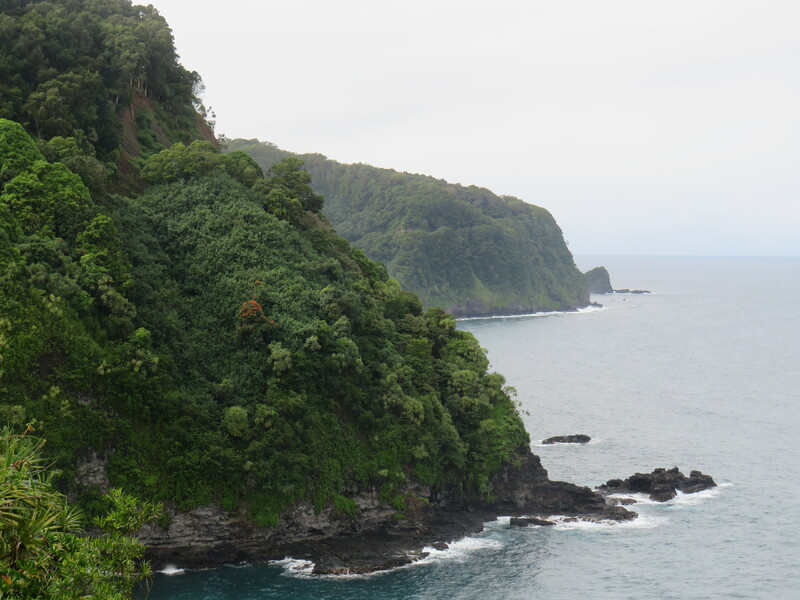 We used the Shaka app to navigate the Road to Hana. The road has 600 twists and turns (remember your travel sickness medications before setting out) and takes you on an epic trip around the northern coastline of the island. 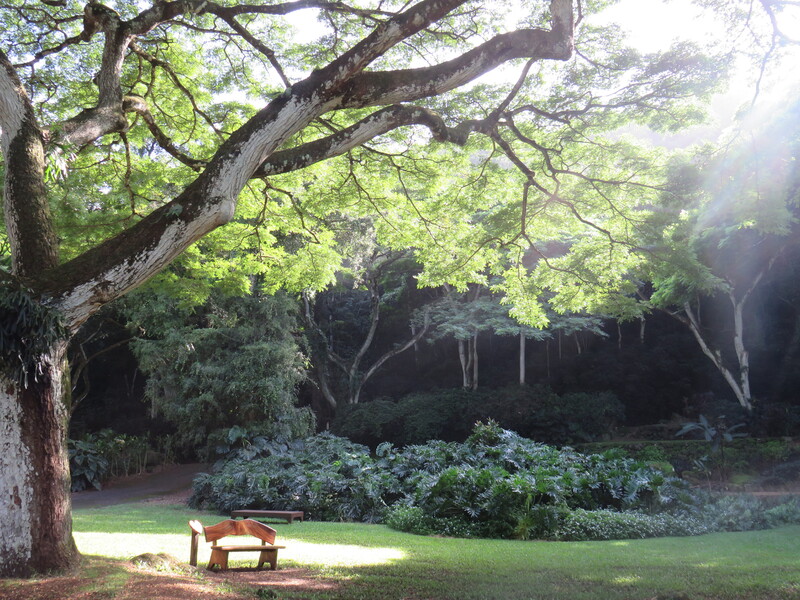 The app notifies you of upcoming gardens, parks, waterfalls, lookout points and stop offs for local grinds (the colloquial Hawaiian term for food). We parked up to check out some rainbow eucalyptus, a beautiful tree that peels bark in shades of green, red and grey. We also took a boat trip to Molokini, a curious crescent shaped island said to be the partially submerged tip of a volcano, and snorkelled with tropical fish. We saw butterfly fish, parrot fish, trumpet fish, etc. and could even hear the low rumble of the fish nibbling on coral. You should be able to hear the nibbling in the video below. It sounds like popping candy. I was on the lookout for a humuhumunukunukuapua’a (Hawaii’s state fish) and didn’t see any, but at least the green sea turtles showed up. And on our return trip to port, a manta ray leapt from the waves before us, prompting happy exclamations from everyone on board. 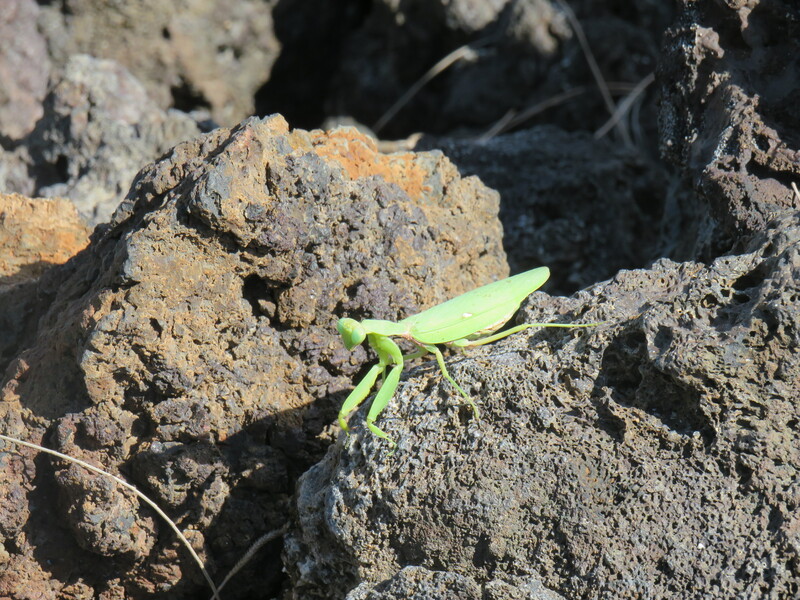 I saw some things I’ll never forget on the Big Island. Praying mantis and enormous dragonflies at the beach. A field of bison. And a freaking volcano. 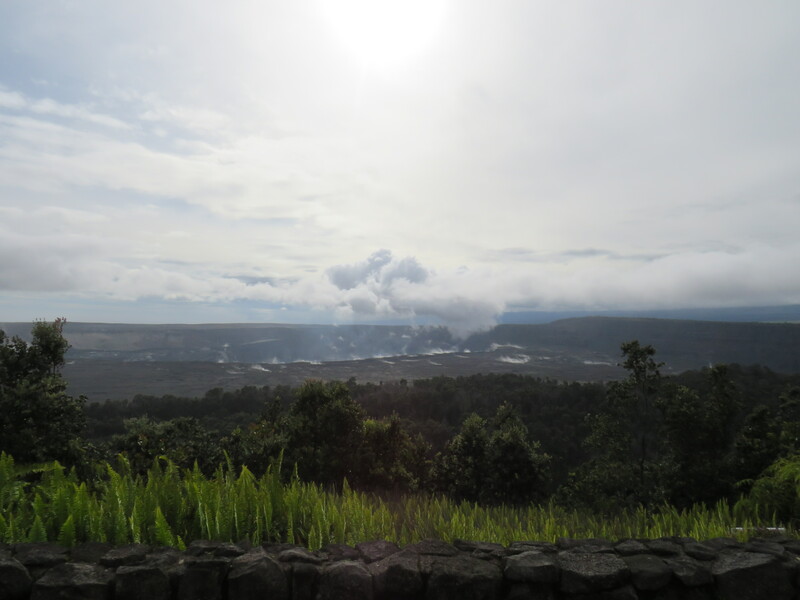 Kīlauea Volcano erupted in May 2018, destroying 700 homes and forcing thousands to evacuate. 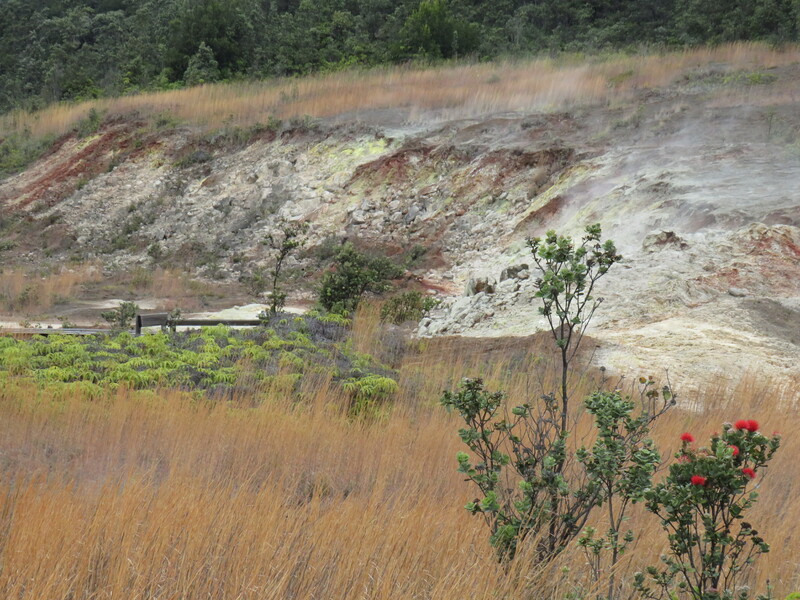 It was safe to visit the volcano park by November, though many areas of the park were still closed to visitors. The volcano crater is currently 4 kilometres wide, and one of the most extraordinary sights I’ve ever seen with my own eyes. Nature is metal. 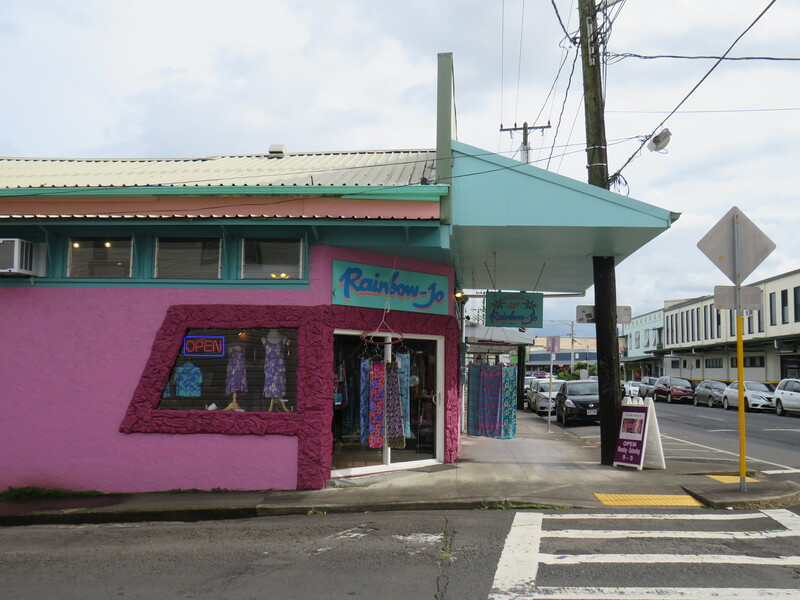 Another highlight of the Big Island is the town of Hilo. I really wish I could’ve spent more time here. It’s colourful and delightful, kitsch and alternative. There’s healthy food, art, great cafés, and lots of thrift stores to peruse. Hawaii’s university is also situated nearby. As for Kailua-Kona, we really liked the outdoor public swimming pool – outdoor public pools are pretty common across Hawaii – and basketball court on the outskirts of town. 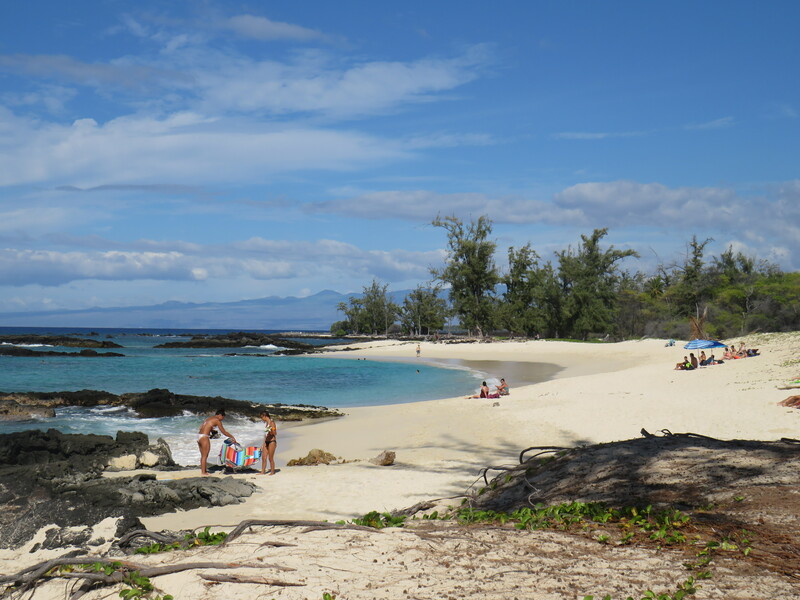 The Kona region is renowned for coffee, and there are some nice coffee places for downtime. We regularly frequented Huggo’s for two great reasons: the free macadamia nut muffins served with breakfast, and waters teeming with tropical fish visible from the dining balcony. Low point on Maui: I ate some fish tacos and got on a boat. The fish tacos made me sick. The boat made me sick. And then I got in the water to watch manta rays at night and none showed up. I was sick from the fish tacos and sick from the boat and I didn’t get to see any manta rays. I’m okay now. Just don’t mention f-fish tacos. Shudder. 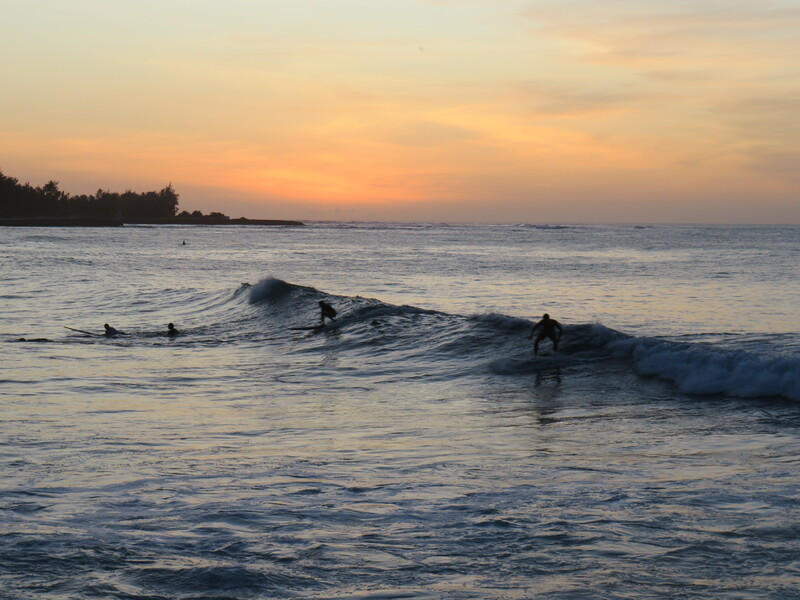 I spent an entire day rubbernecking the surf on the North Shore. I wasn’t watching the surfers, I was watching the freakishly awesome waves. Dangerously high, exhilarating waves. The sorts of waves people should not swim or surf or set foot in whatsoever. There was an official looking guy with a whistle at the beach, warning people to keep out of the water and stay behind the actual caution tape. You would have had to be really stupid to go in the water but I did see somebody bouncing around on a jet ski out there. Insane. I was so entranced with those waves that I took over 500 photographs. Have I said enough about the waves? I mean, I did do other stuff on Oahu. 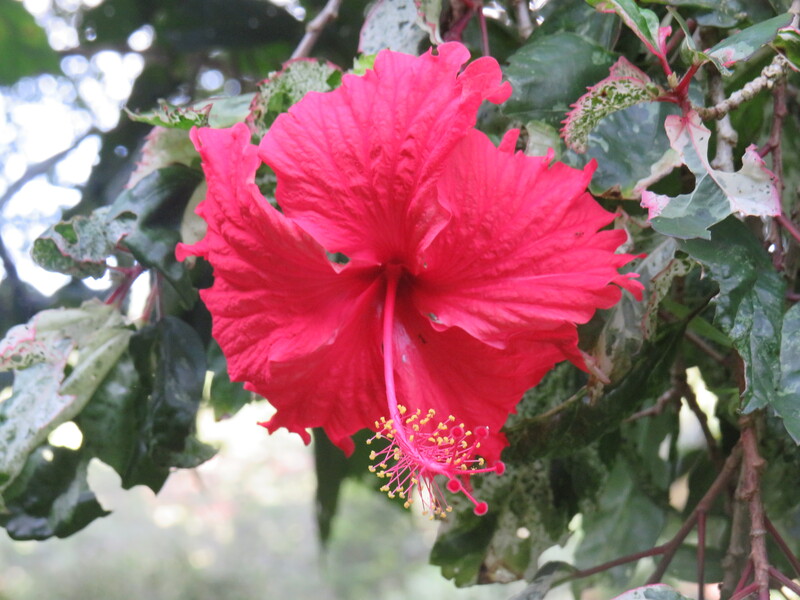 I watched some surfing at Turtle Bay, that was really cool, and I visited Waimea Valley to see native flowers and plants. I even swam in the pool at the base of a waterfall, and there was a rainbow on the actual waterfall. Hawaii, you’re just showing off. 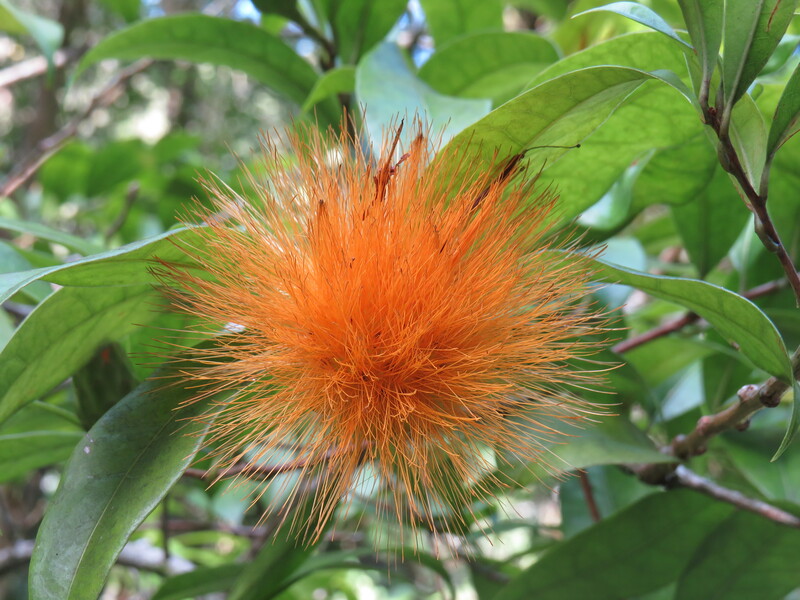 I call this one … Tangerine Puffball! All in all, we spent ten days on Oahu, ten days on Kauai, ten days on Maui, ten days on the Big Island, and returned to Turtle Bay, Oahu for ten days to close out the vacation. It’s strange to say, but ten days was a little too much time for us at each location. (Sacrilege, right?) A week would have been exactly enough. The pace of life is slow and we were restless on occasion. Still, this was an extraordinary trip overall. Hawaii is more beautiful than I could ever have imagined and it was a privilege to spend so much time there. 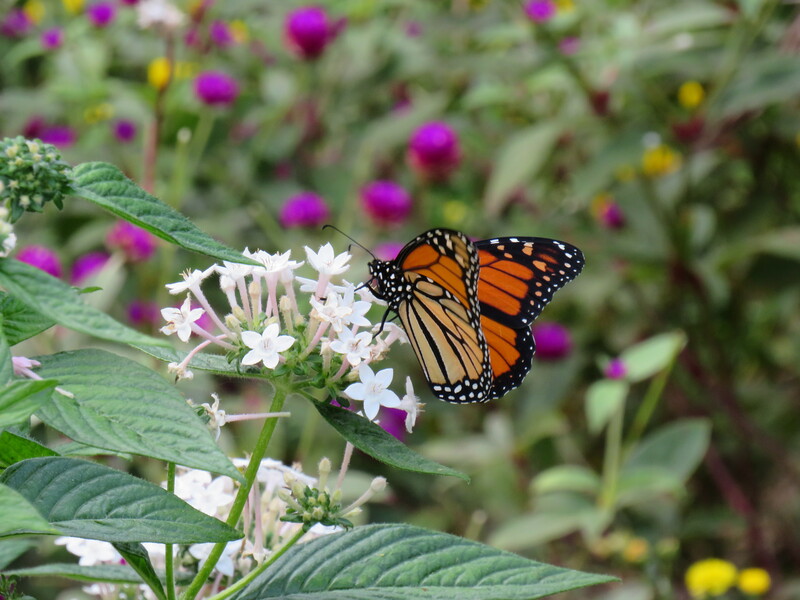 It’s a nature and adventure lover’s paradise, the stuff of technicolor dreams. As I’ve already mentioned, Hawaii is eye-wateringly expensive. It’s hard to do on a tight budget. You have to hire a car to explore effectively and you’ll need to factor this into your budget. Airbnb is the more economical choice when it comes to accommodation, but even that doesn’t come cheap. The ocean isn’t especially safe to swim in. 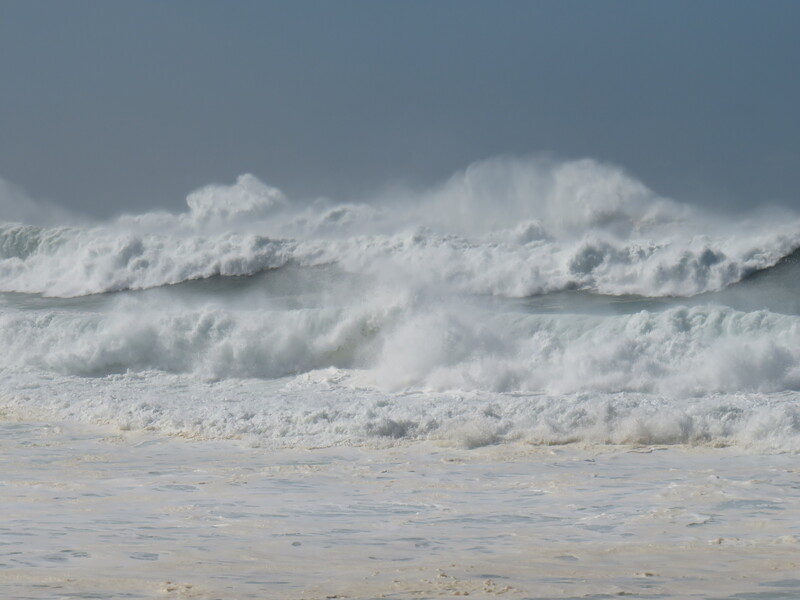 The waves are pretty rough and many tourists drown in Hawaii each year. 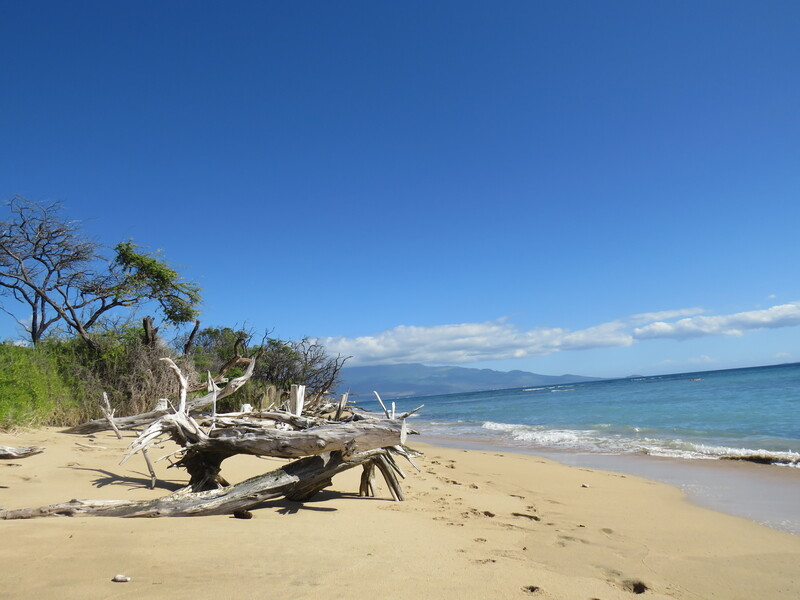 And while it’s tempting to want to swim in secluded places (secret beaches, hidden coves, etc. ), this makes any rescue attempt all the more challenging. There’s not much in the way of nightlife. If you’re looking for European style nightlife, you’ll be disappointed. But that’s not why you’re in Hawaii, right? Fantastic blog Frances, Thank you for brí gong me on the journey. Thank you Carmel! Very much appreciated. Looks like so much fun, and I love the photos!